Tiny 1,900 million-year-old fossils from rocks around Lake Superior, Canada, give the first ever snapshot of organisms eating each other and suggest what the ancient Earth would have smelled like. 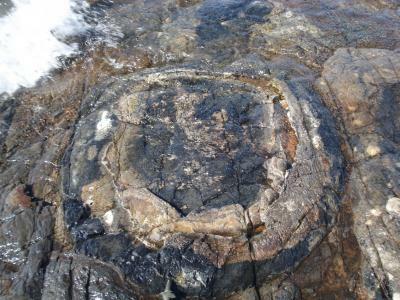 The fossils, preserved in Gunflint chert, capture ancient microbes in the act of feasting on a cyanobacterium-like fossil called Gunflintia – with the perforated sheaths of Gunflintia being the discarded leftovers of this early meal. A team, led by Dr David Wacey of the University of Western Australia and Bergen University, Norway, and Professor Martin Brasier of Oxford University, reports in this week’s Proceedings of the National Academy of Sciences the fossil evidence for how this type of feeding on organic matter – called ‘heterotrophy’ – was taking place. They also show that the ancient microbes appeared to prefer to snack on Gunflintia as a ‘tasty morsel’ in preference to another bacterium (Huroniospora). The team analysed the microscopic fossils, ranging from about 3-15 microns in diameter, using a battery of new techniques and found that one species – a tubular form thought to be the outer sheath of Gunflintia – was more perforated after death than other kinds, consistent with them having been eaten by bacteria.